Globe Telecom held over the weekend the ceremonial launch in Davao City of the $250-million Southeast Asia-United States (SEA-US) submarine cable system which is part of Globe Telecom’s commitment to providing faster transmission, more efficient connectivity and greater network resiliency in Mindanao and the rest of the country. “The Southeast Asia - US Cable System will definitely reinforce the capacity and resiliency of our information infrastructure, leading to improved communication capacities, better access to basic services, increased competitiveness, and smarter cities. It is expected to generate more investments, jobs, and opportunities in Davao region and Mindanao,” he said. Outside of Luzon, the 14,500-kilometer undersea cable is the first direct connection of Globe to the United States via Guam, Hawaii, and California, offering faster transmission of data to the US. It supports ongoing efforts of Globe to further enhance its services in Mindanao such as the establishment of a data center in Davao City designed to address the growing information and communications technology requirements of BPOs, financial institutions, Internet service providers and other content providers in Southern Philippines. Globe invested USD80 million for this new undersea cable system. This is on top of the $750-million capital expenditure of the company this year to enhance its data capacities. The annual investment is being utilized for LTE deployment using the 700 Mhz, 1800 Mhz, and 2600 Mhz frequencies. With a more pervasive mobile LTE data, internet speeds have markedly improved based on international benchmarking studies. 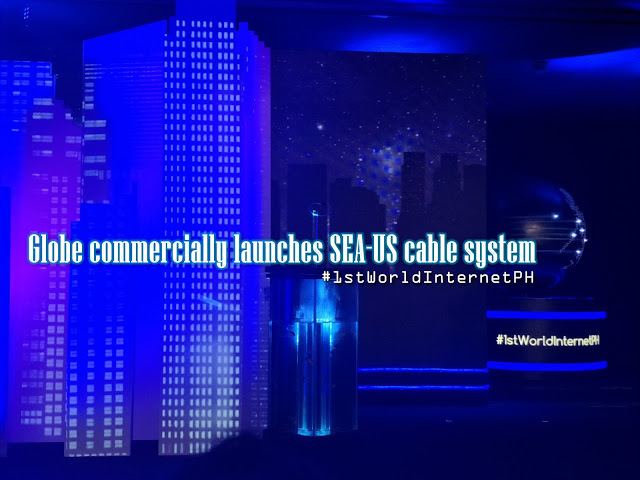 “We are excited about how this new investment because of the immense benefits that the undersea cable system will bring to the Philippines. It will enable businesses to thrive and prosper with 1st world internet connectivity at cost-efficient rates in support of the government’s efforts to make the Philippines become globally competitive. This will also make our network future-ready in anticipation of our customers’ growing bandwidth requirements,” said Ernest L. Cu, Globe President and CEO. 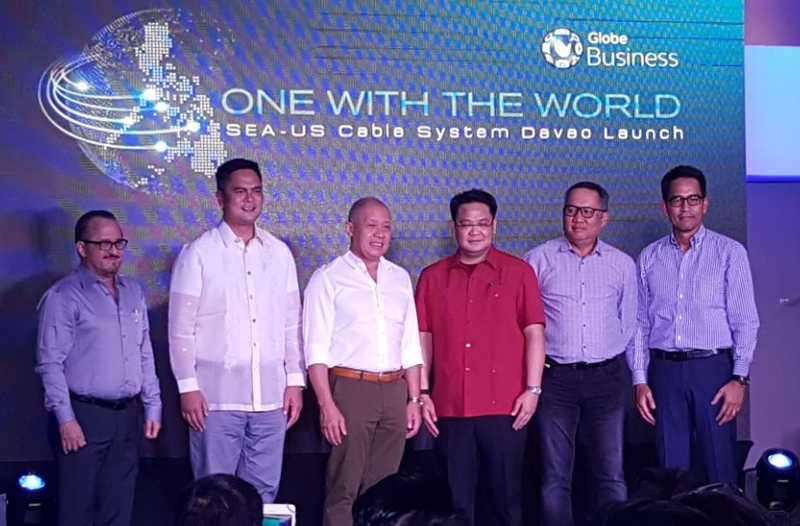 “The SEA-US cable system will augur well for businesses in Davao City. It will attract more players from major trade and industry centers in Mindanao region and expand more BPO spaces - which means the creation of more jobs in the service sector and more livelihood opportunities for not only the people of Davao but also for neighboring cities and municipalities ,” said Peter Maquera, Senior Vice President for Globe Enterprise Group. At the same time, the facility will ease the country's dependence on international cable systems that go through Japan / North Asia to connect to the US and ensure the resiliency of internet connectivity. With three domestic fiber optic backbones and several investments in international undersea cables, Globe Telecom’s network was able to provide uninterrupted internet connection to its corporate and individual customers despite the submarine cable cuts caused by the recent super typhoon in Hong Kong which severely affected services of other internet providers in the Philippines and the region. The SEA-US cable system is connected to the Globe cable landing station in Brgy. Talomo, Davao City which also houses the Power Feed Equipment necessary to run the system. The facility uses the latest 100 gigabits per second transmission technology to deliver an additional 20 terabits per second capacity. The additional capacity will cater to the exponential growth of bandwidth between the two continents. The system was built by a consortium of 7 international telecommunications companies and links five regions that include Manado (Indonesia), Davao (Philippines), Piti (Guam), Oahu (Hawaii, United States), and Los Angeles (California, United States). Aside from being part of the SEA-US consortium, Globe is also a member of an international consortium of telecommunications and technology companies operating the Southeast Asia-Japan Cable (SJC) system which links seven territories that include Brunei, mainland China, Hong Kong, Japan, Singapore, and the Philippines. It has also made investments in the East Asia Cable system (EAC), Asia Pacific Cable Network-2 (APCN2), Tata Global Network–Intra Asia cable system (TGN-IA), the City to City cable system (C2C), and is interconnected with major Trans-Pacific Cable systems that encompass the Unity, Tata Global Network-Pacific, (TGN-P) and the Japan-US Cable Network (J-US). Mercato Centrale just got GCash'ified!